AiClay - a Haven of Miniature Food: Workshop: Miniature Basket of Bread. I managed to get a reduction in rental costs, and I'm going to transfer this reduction into the workshop fees. 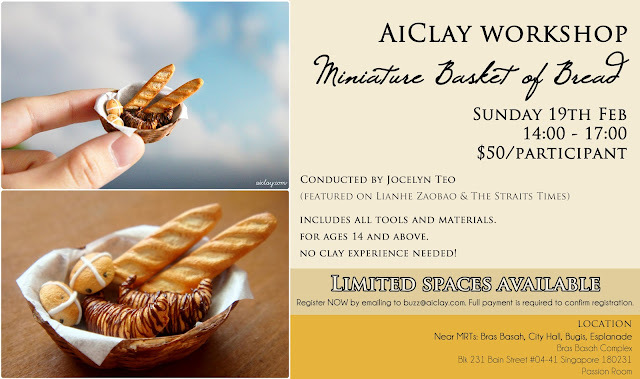 Therefore the workshop is now only $50/pax! It was originally $65, the poster has been edited to reflect the change. Please email me for a slot ASAP as I'm expecting them to be taken really quickly! As spaces are limited, please email me to confirm your spot before sending payment. Payment details will be emailed to you then. *Please note a slight amendment. I will be accepting participants aged 10 years and above for this workshop. However participants 12 years and below will need to print a copy of a consent form, as you will be working with sharp tools. Please email me for the consent form. A parent/guardian will have to read and sign on the form as acknowledgement. Print out the form and scan in the signed copy and send it to buzz@aiclay.com OR bring the signed copy to the workshop itself. Rainstop Lee: Hi! Aww I would love to have you at the workshop too!